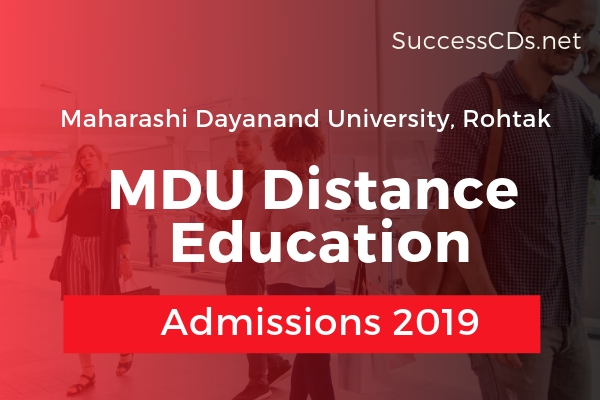 MDU DDE Admissions 2019 - Online applications are invited for admission (new and old students) to the following Distance Learning Programs for the Session 2019-20 and applications are also invited for admission to M.A. (History) Final Year. For B.A./B.Com (Part-II/Part-III): Pass in B.A./B.Com Part-I/Part-II examination, under 10+2+3 scheme of Maharshi Dayanand University or of another University which is recognised as equivalent to B.A./B.Com of this University, provided that the subjects offered by the candidate in B.A. or B.Com Part-I and Part-II are the same as are available in B.A./B.Com Part-I & II at this University and the candidate is otherwise eligible.